A guest post by a London CAAT member who is also involved with UK Uncut! You wouldn’t think it’s a tough choice– should we be spending tax-payers money on keeping our hospitals and libraries open, or should we subsidise arms exports that make up just 0.3% of the UK’s GDP? Oh, and many of these weapons are sold to countries using them to suppress popular movements such as in Bahrain and Turkey. But aside from the gross human rights impacts of selling weapons, whilst all other public spending is being cut, the military budget remains protected. The government continues to push through austerity measures, claiming the cuts are a necessity. But Cameron’s priorities are clear, as he continues to prioritise the UK weapons market over social spending and human rights. Each year £700 million is wasted on subsiding arms exports – enough to fund 33,000 newly qualified nurses. But instead, David Cameron is intent on being seen as a leader in “defence” and hoping to establish new markets for British weapons. This couldn’t be clearer than his meeting last week with the Bahraini president at a time when protests in Bahrain are being met with violence. This September, the world’s largest arms fair (DSEI) is coming to London. Foreign delegates, military personnel and arms dealers will be able to browse a wide range of weapons, including different models of tear gas that is currently being used in countries including Brazil and Turkey. The arms fair receives major financial, logistical and political support from the UK government. Newham, where DSEI happens, is the second most deprived borough in England. It made the deepest spending cuts of any London borough, has called the bailiffs on almost half its tenants (seriously) and is evicting council tenants to as far as Stoke on Trent… but somehow DSEI policing is affordable. 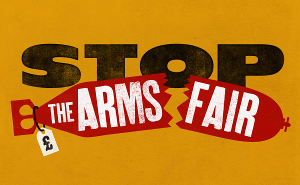 Join us on 8 September to show solidarity with international movements against state repression and say no to the arms fair. Yes to welfare! Share this blog post on Facebook or Twitter – especially if you’re a Newham resident! If you liked this post, you may love our Who pays for high military spending? post which goes into a bit more detail about austerity as a whole.